If you grew up in the 70s you probably didn’t learn how to clean wood floors because you didn’t need to — that decade’s home decor was as bad as its hairstyles. Even though flare-leg pants may be making a comeback, carpeting in the kitchen or bathroom remains as distasteful as poodle perms for men. With wood flooring in demand among buyers and renters, property owners are looking to increase resale value (or rental income) by replacing old carpeting with wood floors. That renovation isn’t cheap, either: wood flooring costs between $9 and $15 per square foot, which is three times more expensive than carpet. When you’ve made that kind of investment, you need to know how to clean wood floors properly, so they look good for years to come. 1. Do this every other day. Dust, pet hair, dirt, and food debris are all abrasive. Keep these things from building up and marring your wood floor’s finish by dust mopping. While a Swiffer might be sufficient for touch-ups, you need a wool dry mop for busy households. Unlike brooms or disposable pads, a wool mop doesn’t just move dirt around — it holds onto it until you shake the mop outside or wash it in your sink. 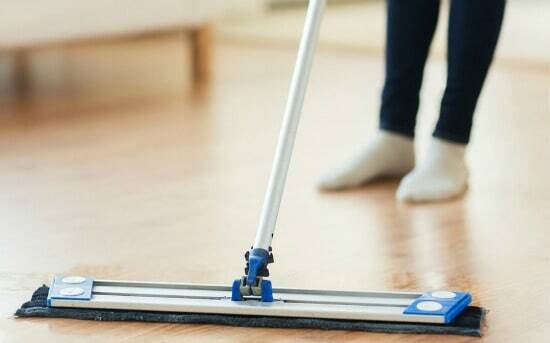 Buy one large enough, and you can get every floor in your home dust-mopped in a matter of minutes. Too much water is bad for wood floors, but you do need to wet mop weekly. Skip the sponge mop and bucket — that’s far more water than you need. 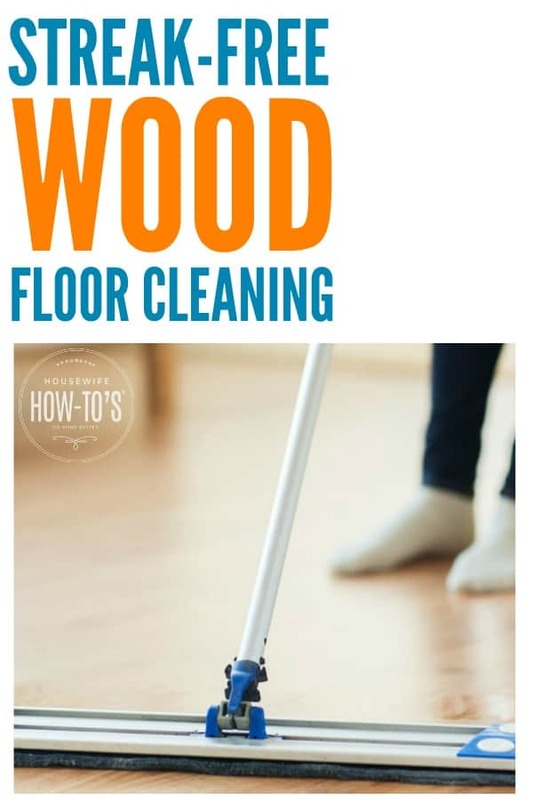 The best way to mop a wood floor is with a good microfiber mop and a spray bottle, so you can control the amount of moisture hitting your floor. Try it with the DIY Wood Floor Cleaning Solution below or use your favorite commercial wood floor-cleaning product. Every few months it’s a good idea to give your wood floors a thorough cleaning with a vacuum that does not use a beater bar (which can damage your wood flooring). This means using the bare-floor setting, flooring attachment, or even a stick vacuum. It also involves lifting and vacuuming rugs (on both sides) and moving furniture to clean under it. Follow with a thorough mopping using the method described above. 1. Scuff marks come up quickly with a tennis ball. Save your back by cutting an X in the top, then slipping it over the end of a broom or mop. After dust mopping, use the ball to buff away scuffs from shoes and furniture. 2. Greasy marks can often be erased. Literally. After dust mopping, grab a pencil and rub the spot with the pink eraser then wipe with a clean, damp cloth. 3. Sticky messes from things like tape should be treated by rubbing them lightly with olive or vegetable oil. Allow the oil to sit in place for a few minutes, then wipe away with a microfiber cloth. Clean the area afterward to remove the oil. 4. Water stains leave white marks, but they’re relatively easy to remove. First, wait a couple of days to let the area completely dry out. Next, cover the spot with a dry washcloth and run a warm iron over it (NO steam), keeping the iron in constant motion, for a couple of minutes. If the stain persists, rub the area very firmly with a microfiber cloth dipped in lemon oil. Wipe the oil away once the stain disappears then follow with a wood floor cleaner to remove oil residue. 5. Nail polish and paint usually comes up quickly with rubbing (isopropyl) alcohol if you get them while they’re wet. Here are more ways to clean spilled nail polish once it’s dry. 6. Pet stains should be cleaned immediately by mopping up the mess then wiping with a 1:4 vinegar-water solution to get rid of the odor. For laminate floors, follow my advice here. If your wood floor is new, you should follow the manufacturer’s cleaning instructions or risk voiding the warranty. If such things don’t matter to you, or your warranty has expired, a DIY cleaning product is a great way to save money while getting your floors just as clean and streak-free as the commercial counterparts. NOTE: Do not use castile soap in this recipe. Do not use a liquid dish soap that is scented, moisturizing, anti-bacterial, or which contains “oxygenating action.” Use a plain liquid dish soap — original Dawn (or Fairy in the UK) works best. To prepare: Combine the water, white vinegar, and rubbing alcohol in a spray bottle. Add three (3) drops of liquid dish soap. (DO NOT use more or you will leave streaks!) Add 5-10 drops of your favorite essential oil. Gently swirl to combine. To use: Dust-mop the floor well, then lightly spray a small area and wipe with a dry microfiber cloth. Repeat until you’ve cleaned the whole floor. Vacuuming once a month?? Wow, you must love living around dirt. Hey, Kim — I’m very clear that people should dust mop their wood floors daily. A broom and dustpan are used instead, kinder to the floor! Need it done quickly in between sweeping? That’s what dust mops are for! The DIY floor cleaner recipe is very similar to one I just looked at. I would be very hesitant to use alcohol on a sealed wood floor for fear of the alcohol eventually removing the seal. The alcohol in this recipe is largely diluted by the water, but you should go with whatever solution you’re comfortable with. Great advice. Thank you. When you say “drops of dish soap”, how do you define a drop since dish doesn’t drip like an essential oil? Is it a squirt or the smallest drop you can achieve? Thanks for your help. We’re looking for a very tiny amount here, just enough to help dissolve the bond between grime and the floor’s surface — too much, and the soap will leave streaks. I’d say 1/16th of a teaspoon, but most people don’t have a tiny measuring spoon like that. Castile can leave behind a film. You’re awesome, Katie. Thanks for posting this informative, comprehensive article. My dog has really scratched my hardwood floors, so we decided to replace an area in our home where it was the worst. I wish I would have seen your article before we did that; maybe we could have cleaned them! Your do-it-yourself cleaning solution seems like it would really clean my floors! Thanks for sharing!